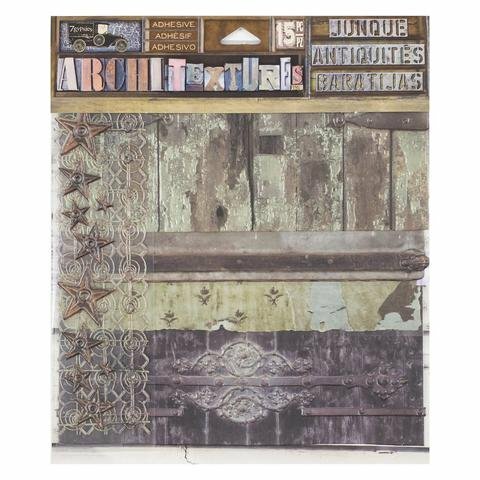 Inspired by cabins of the past and present that preserve memories of long ago, this pack of faux finished pieces features an array of unique salvage art that has been transformed into caftable products. These adhesive embellishments can be used as backgrounds, layers, etc. for cards, layouts, mixed media projects, craft projects, shadow boxes, journal covers, books, junk yard projects and so much more. Use them as they are or you can tear, die cut, fold, cut and more. Each piece was made using patented technology that allows us to create the finishes to not only look real, but they actually feel real, down to even the detailing of raw edges and nail holes. No two sets are alike and they work wonderfully together. With a rustic, aged feel each piece represents finishes you might find in a cabin or objects that may have been left behind. A set of rusty, metal stars, a vintage bed spring, distressed wood, aged wallpaper, the side of a trunk and wooden table top with ornate metal detailing. Each piece takes you away to the past and brings out memories from the cabin's past. Stained wood plank with metal details (5.25"x5.25"